Indoor Air Quality | RoyalAire Mechanical Services, Inc.
Association) standards and procedures listed in IAQA Document IA2001-C. 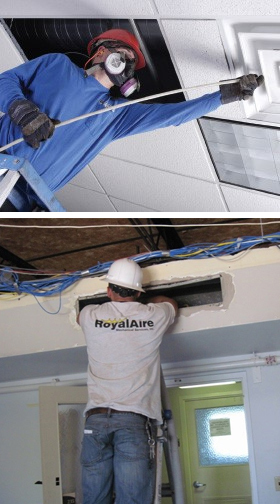 The RoyalAire Mechanical Services, Inc. IAQ staff consists of certified C.V.I. (Certified Ventilation Inspection), A.S.C.S. (Air Side Cleaning Specialist) technicians and approved CMI (Certified IAQ/Mold Inspectors). All of our technicians are also trained for cleaning of fibrous liner and fiberglass air distribution systems, per NAIMA (North American Insulation Manufacturers) standards. We are committed to investing the time and expense for the continued education of our certified technicians. This ensures that with the on-going technical developments and advancements, we are always prepared to deliver the most thorough and accurate results to our clients.